For comprehensive dental care in Odenton, MD, look no further than Odenton Family Dentistry, your trusted, local dentist office! Our practice is here to take care of your whole family with our wide range of treatments. Whenever possible, we offer same-day treatment so you can get the care you need without having to wait for another appointment. Your time is precious and we want to make the most of it! Even if you’re not quite sure what you need to maintain healthy teeth and gums or to get the smile you’ve always wanted, we are happy to walk you through your options and give you our professional recommendations. 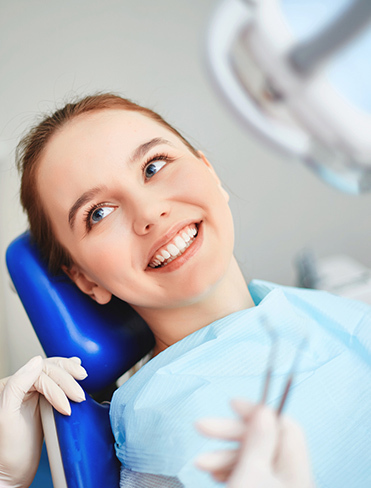 After all, our role as dental care professionals is to build a meaningful relationship with you where you feel comfortable expressing your concerns and you can leave with tip-top health and a great, big smile. Do you have a dental emergency? If you are experiencing any of the following or another urgent issue, please call us immediately at (410) 674-3400. Odenton Family Dentistry provides same-day emergency dental care so you can take care of any issues as soon as possible. Don’t have any specific concerns? Maintain great oral health with routine dental care. Are you in pain or missing teeth? Restorative dental care can help. Want to improve your smile? Consider cosmetic dental care!